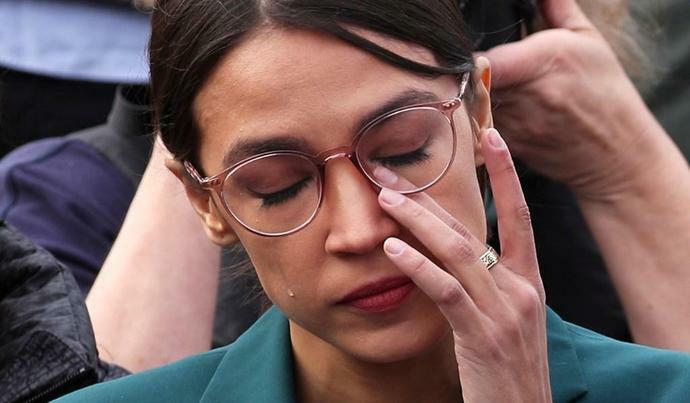 "This is one of the most urgent moral issues and crises that we have in America right now," Ocasio-Cortez said during a rally outside the Capitol building. "This is not a political issue. Children dying in detention centers should not be a partisan concern. It should be a universal concern for every American in the United States. "We're here to say that an agency like ICE, which repeatedly and systematically violates human rights, does not deserve a dime," she added. Invoking Secretary of Homeland Security Kirstjen Nielsen's claim that the agency does not have a policy of separating migrant children from their parents, Ocasio-Cortez argued that Nielsen is ignorant of the enforcement policies pursued by her subordinates. "I will not give one dollar to a secretary who does not care about her life and does not care to investigate a child's death," she said to applause. "I will not give one dollar to black-box detention facilities that think that some people in this country are deserving of constitutional protections and others are not." The Trump administration separated at least 2,600 children from their parents under a "zero-tolerance" immigration-enforcement policy implemented from May 6 through June 20 of last year. "We are a nation and land of laws. Not just some people are subject to laws and others are not," she said. "When we are a land of laws, what that means, is that every person that steps foot on this soil deserves the consideration of due process. They deserve the protections. They deserve to have access to our Bill of Rights. That's what makes this nation special."